A creative and funny movie about a couple that dies and finds themselves having to deal with the new people who move into their house. A pretty strange movie about a couple that finds themselves being dead, while still living on earth. These two people, Adam (Alec Baldwin), and Barabara, (Geena Davis,) now have to deal with the new family that moves into their home. Only as ghosts, there’s not a whole lot they can do about it. The movie is wildly imaginative and really utilizes the creativity of director Tim Burton. Michael Keaton, as the title character, is great. What we end up getting is a pretty creepy, often funny, and very unique film. Beetlejuice is a strange movie. It’s one of those films that is really like no other. This is a movie about a couple that tragically dies and then has to deal with the rules of the dead, while still being here, on earth. We’ve seen plenty of movies about people who die and then go up to heaven, from Defending Your Life to What Dreams May Come. Beetlejuice is different. It’s about staying here and trying to manipulate some people on earth, despite being dead. The movie is directed by Tim Burton, and it’s got his mark and style all over the place. This is a man who specializes in goth looks and outcast heroes. He is a halloween kind of guy who puts the creepy into non-Halloween situations. One could say that Burton specializes in making Christmas feel like Halloween. (The Night Before Christmas, Batman Returns.) His best and most known film, Edward Scissorhands, combined fable, horror, and of course, Christmas. Now, Beetlejuice is a little different. It is very much about the world of the dead, and how that would impact the living. Burton gets two of his classic, dressed all in black, or extremely dark heroes into this one. There’s Beetlejuice, himself, of course (played by Michael Keaton,) and then there’s Lydia Deetz (Winona Ryder, of Scissorhands fame.) She is dark and depressed and finds the ghosts in her house to be the only ones she can truly relate to. When Burton is not making fantastical films about sweeping atmoshphere (Batman, Sweeny Todd,) he is focussed on the suburbs and neighborhood life. Scissorhands and Beetlejuice are both examples of that. 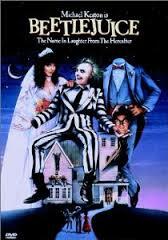 The house in Beetlejuice is as important to the story as any one of the characters. In fact, one might say that the entire story revolves around this house and the couple’s mission to keep it out of the hands of anyone else. From the very start of the film, when Adam (Alec Baldwin,) and Barbara, (Geena Davis,) are both alive and well, the house is already an issue. They have an annoying neighbor who works as a real-estate agent and wants them to sell. Despite the two of them happily living there, and having no plans to move, this neighbor still gives them a hard time, simply because she knows how much the house might be worth, if actually put on the market. The couple spends most of their time in the attic, where Adam has a model of their neighborhood, which is his pet project. He spends long hours pouring over this model, as if it is a treasure that he can’t stop polishing. One day, he and Barabara go for a drive. When they come to a wooden bridge, the start driving across it, but then see a dog in their path. The two of them swerve to avoid hitting the dog, and end up in a lake. The car goes down, and neither one of them comes up. We then cut to their house and see the two of them walking inside, both dripping wet. It turns out they are dead, as they first realize when looking in a mirror and seeing no reflection staring back at them. With the couple dead, the real-estate agent starts showing the house and gets it sold pretty fast. A family moves in and they are extremely strange, to put it mildly. There’s a mother and father, Charles (Jeffrey Jones,) and Delia (Catherine O’Hara,) then their daughter Lydia, and finally a man who works in the art world, alongside Lydia, and is either her agent or manager or something, named Otho. This guy and Delia are the strange ones, with bizarre and horrific concepts of art. Both Charles and Lydia seem to roll their eyes at them, but neither one actually says anything. That responsibility falls on Adam and Barbara. They don’t want anyone living in their house, and especially not these people. The couple stays in the attic, and locks in from the inside so that the family cannot access the room. They sit there, plotting ways to get the family to move out. Only there’s one problem. None of the living can actually see them. They make a couple of attempts before realizing this. First, Babara hangs herself in a closet while Delia is looking in it, taking measurements. Then she tries removing her face from her head. Nothing. No reaction from Delia. Adam tries removing his head from his body, altogether, but still no success. The couple realizes that while the family members can’t see them, they can see the things that these ghosts manipulate. So one night, Adam puts a white sheet over his head and walks around the house making scary ghost sounds. Delia and Charles just think it’s Lydia being silly. At this point the couple starts to feel like they are running out of ideas. They find a book of the rules for the dead, and start reading it, thinking maybe there will be something in here that they can use. They also keep seeing signs for a guy named Beetlejuice, but don’t know what or who he is, and are not so sure they want to find out. The book gives them instructions about drawing a door in a wall and then pushing it. The door starts to light up and open. It leads them to a hallway and waiting room for the dead, where they meet all kinds of strange patients. These include people who have died in the most bizarre and crazy accidents. Pretty much everyone they run into has been dismembered in some way or another. 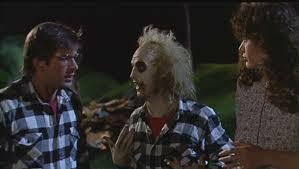 The couple meets with a consultant here, who warns them not to contact Beetlejuice. And so they don’t. Instead, they try to manipulate the families bodies themselves, during a dinner party where Charles and Delia invite over a bunch of friends. The couple controls the bodies of these people as if they are marionettes, making them sing and dance around the table to the song Day-o (The Banana Boat Song.) It’s a pretty fun and wild scene, where even the food on the table comes to life for a moment and grabs the guests. And yet, despite all of this, it still doesn’t work. Instead of being horrified that their house is haunted and running for the hills, the family members now think they’ve stumbled on a gold mine, and want to exploit this house and their ghost tenants as much as possible. Now the couple calls Beetlejuice. Finally. He’s the title character and he only really arrives about halfway into the film. Adam and Barbara are out of ideas. Beetlejuice shows up inside of their model, and I like the way the movie makes it a whole big process to contact him, including saying his name three times and digging up a grave. Unfortunately, Beetlejuice can’t really help them, and so they are back to square one. Only since they have made the family aware of their presence, the family members now want to control these ghosts. Otho comes over dressed in a robe and ready to conduct a seance. It turns out to be much worse than just trying to communicate with the ghosts, and instead, becomes about controlling and even torturing them. This prompts Lydia to call Beetlejuice for help. The climactic scenes are where Beetlejuice really gets to show off. It’s about time. We’ve waited for this sort of thing the entire movie, and at the end, we finally get it. That being said, this is definitely not a situation of too little too late. That’s because both it’s not too little (the Beetlejuice stuff at the end is pretty immense,) and it’s also a situation where the material leading up to this was pretty good and entertaining, even without Beetlejuice. He is absolutely saved for the end, and it only makes the movie better, being given that opportunity to see him in action, once and for all. This is a good movie and holds nothing back and really strives for being creative and out there.